The key to the Eagles offense and season will be keeping No. 5 upright for the whole season. If McNabb can stay healthy, I believe this team will challenge the Cowboys for NFC East supremacy. Donovan McNabb battled injuries once again last season and yet was still able to throw for more than 3,000 yards, complete 61 percent of his passes, and throw nearly three times more touchdowns (19) than interceptions (7). 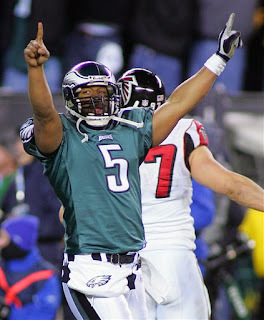 McNabb, when healthy, is still a top-level talent at the quarterback position. Kevin Curtis was a pleasant surprise at wide receiver in his first year with the Eagles. Curtis' numbers should only improve in 2008 as he becomes more comfortable with McNabb and the offense. Reggie Brown, despite an inconsistent 2007, still managed a career high 61 receptions. If Brown can start the season hot, 75 receptions and his first 1,000 yard season is a real possibility. The addition of DeSean Jackson (who remains unsigned) will be key for this passing game that lacks a true deep threat. Jackson has the kind of ability to take a hitch route for six from anywhere on the field, and that is something the Eagles desperately need from someone other than Brian Westbrook. A return to health by L.J. Smith gives McNabb a capable target in the middle of the field and in the red zone. Brent Celek will look to build on a strong rookie season and gives the Eagles a nice two tight end package. The headline of 2007 for the Eagles was Brian Westbrook's transformation from underrated utility back to headlining superstar. Westbrook lead the Eagles in receiving with 90 catches and rushing with 1,333 yards. The former 'Nova star has quickly evolved into the kind of run/pass threat that is matched by few others. Add in a healthy Correll Buckhalter and the talented second-year combo of Lorenzo Booker and Tony Hunt, and the Eagles' backfield is as tough as any to defend with inside-outside threats. Protecting McNabb and paving the way for Westbrook is one of the best offensive lines in the NFC, particularly one who runs the screen pass better than any team in football. Andrews is the star, with veterans Runyan and Thomas anchoring the ends for one more year. The offense was a top ten unit in 2007. The offense returns all but one starter. The pieces are in place to return to the top of the NFC East.